who were feeding on the ground in the olive grove. Suddenly they all took off and sat in a tree in our garden. Lovely capture of them in the tree! nice shot of those starlings - they get everywhere, don't they? wow so many of them! There sure is alot of them! Top heavy :) like the details on those birds. 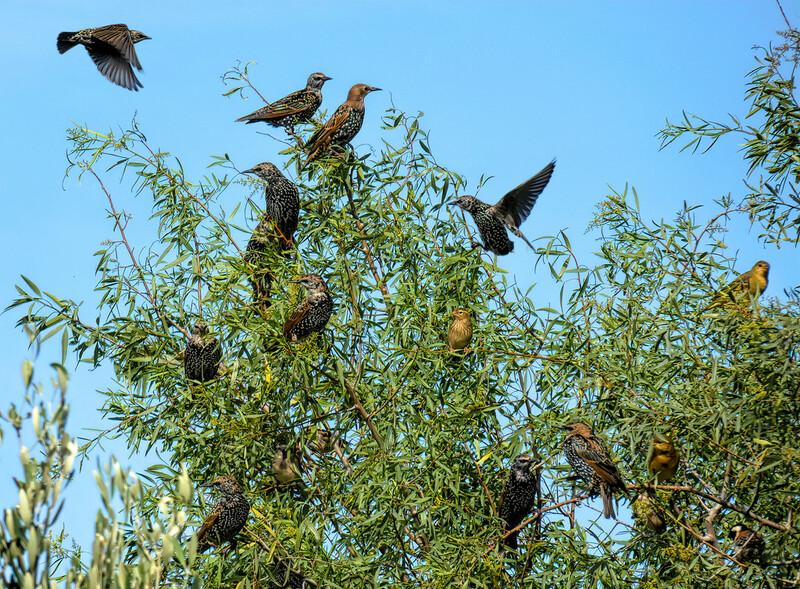 If you have one starling, you have a bunch! Nice clear shot of the whole group. They do travel in large numbers! @pamknowler @shannejw @koalagardens @gigiflower @peterday @momamo @happysnaps @onewing @louannwarren @amyk @merrelyn @jacqbb @tonygig @milaniet @sugarmuser @grammyn @rickster549 Thanks for the kind comments and fav, it is very much appreciated.